Researchers are gearing up for a new EU-funded project, which will be coordinated by LMU. The project will study the origin, behaviour and dispersion of volcanic ash, as well as its impacts on the environment and on human health. Volcanoes send plumes of ash billowing into the sky, forming thick clouds several kilometres high that obscure the Sun. The ash particles return to earth, making breathing difficult and coating everything with a layer of ash. Earlier this month, a murky rain of ash from Sakurajima volcano in Southern Japan covered houses, streets and vegetation in the city of Kagoshima and surrounding towns; a graphic example of the dangers inherent to the huge amounts of ash produced by such explosive eruptions. The eruption of the Eyjafjall volcano in a sparsely populated area of Iceland in April 2010 brought another danger to fore: The high-altitude ash disrupted air traffic between Europe and North America for a week, causing significant and far-reaching economic damage. “And these are not isolated events. There are approximately 500 active volcanoes worldwide, several of which are located in Europe. We must therefore expect, and prepare for, similar events in the future,” says Ulrich Küppers, a staff scientist in the Department of Earth and Environmental Sciences at LMU. 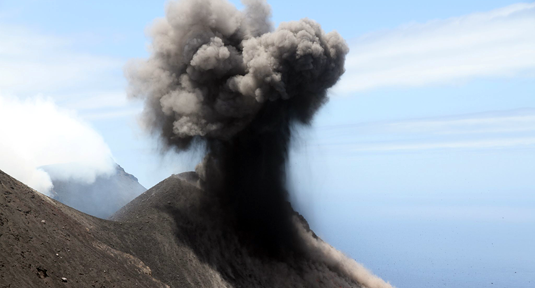 “Since we have no way of preventing such eruptions, we can only hope to minimize their effects; to do that we need to know more about the properties of volcanic ash and the diverse negative effects it can have on us and on our environment”. Technically, the term “volcanic ash” refers to particulate material with dimensions of less than 2 mm produced and dispersed in the atmosphere by explosive volcanic eruptions. The ash may comprise fragments of 1) glassy or crystalline magma, 2) older volcanic rock or 3) crystal fragments; or a heterogeneous mixture of all of these.